Anyone else have $2 per pound fresh strawberries greeting them at the supermarket. Hurray! Spring is here and fresh strawberries scream out, “Put away those snow shovels and get out those cute cocktail umbrellas!!”. Yes, I am ready. I made a bunch of dark chocolate covered strawberries for my favorite club. These wonderful women get together once a month to hear a speaker and to support each other in their endeavors. It was my turn to bring snack and the pressure was on. You see, since they know I am Snack Girl, I can’t just show up with a bag of Doritos. What would that do to my healthy snacker reputation? I didn’t have time to bake or shop so I just dipped some strawberries in chocolate and refrigerated them until it was time to go. How were they received? Let’s just say that only 4 strawberries made it home, which was perfect because I have four hungry family members (including me). What do you do when you see fresh strawberries? Lay a sheet of wax paper or parchment paper on a cookie sheet. Wash and dry strawberries leaving on the leaves. Heat chocolate chips in a double boiler or small bowl in the microwave. If using the microwave, heat in one minute increments and stir every time you take it out to prevent it from burning. Dip strawberries on a time in the chocolate, immersing just half of the strawberry. Place on paper lined baking sheet and refrigerate for 20 minutes. Enjoy! 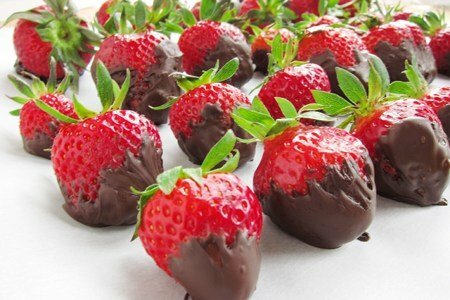 Love strawberries and chocolate! Just saw a post that you mix 8 oz cream cheese with 2 Tbsp. powder sugar and stuff the strawberries and sprinkle crushed graham crackers on top. Now add some chocolate to that and you have a great dessert. I was bummed to see the 1.3g sat fat per strawberry as I could easily see myself having like four of these. However, even that is only 5.2g, which for me is under 17% of my daily allowance... not too shabby! Chocolate dipped strawberries are so good! Tho I have never had the dark chocolate on them. You can make a healthier chocolate dip (aka no soy or other additives) mixing only coconut oil and a high-quality cacao powder. Melt the coconut oil and stir in the cacao. The coconut oil will set up again upon cooling. You can make a healthier chocolate dip (aka no soy or other additives) using only coconut oil and a high-quality cacao powder. Melt the coconut oil and mix in the cacao. The coconut oil will set up again upon cooling. I melt one dark chocolate Dove Promise and spread it on 3 dried figs or other fruit. It spreads easily and is yummy. Tastes like candy. Will try it on the strawberries now. One of our favorite desserts is: dip fresh strawberry into light sour cream and then into brown sugar! I know it sounds weird but it is Delicious!!! You can use real sour cream but aren't we all trying to cut back on calories? My 91 year old mother-in-law introduced me to this! YUM! Christina, love the idea of using coconut oil and cocoa powder thanks.